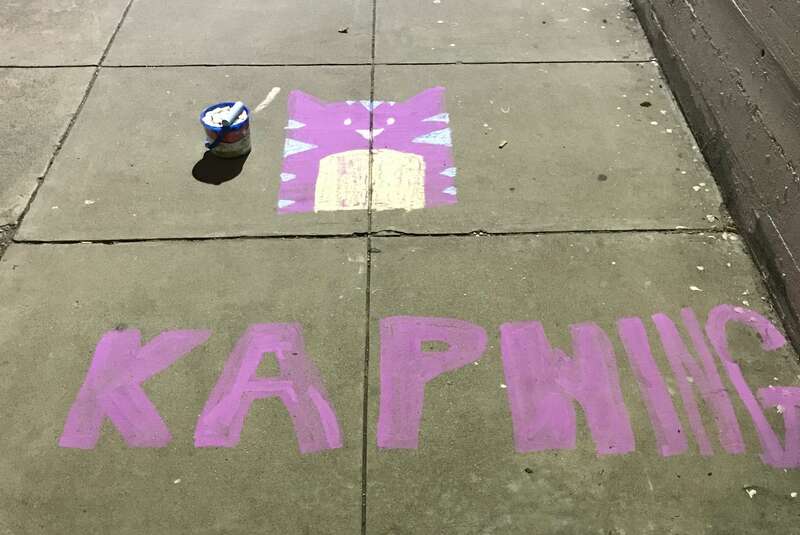 On Tuesday night, we took to the streets with sidewalk chalk to let the world know about our video editing startup, Kapwing. In this post, I’ll tell you about our experiment with chalking SF as a growth tactic. I got the idea for chalking from my college days. As part of student groups promoting an event or a fundraiser, my peers and I would chalk reminders across Stanford campus so that students saw them on their way to class. Now that I’m working on my own startup, I’ve started noticing opportunities to promote our website, and the open, well-trafficked sidewalks of San Francisco looked like canvases. 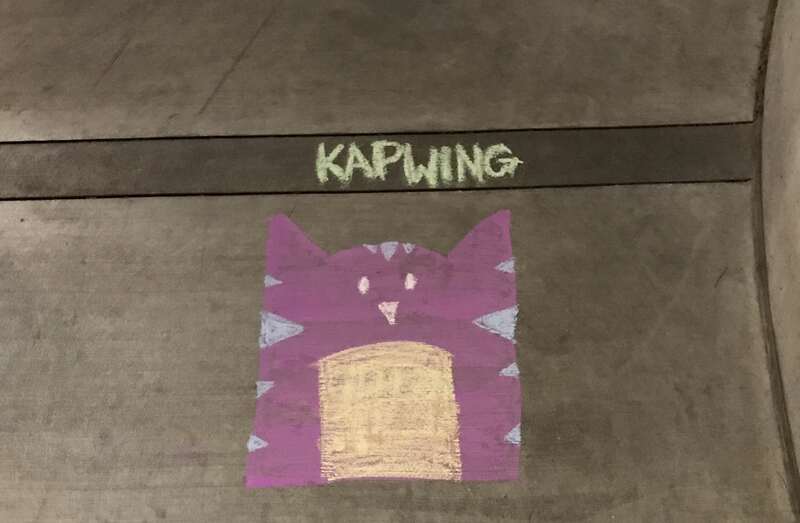 Kapwing is a video editor for entertainers, students, artists, and casual creatives, the kind of people who might be amused by a cartoon cat hand-drawn on the pavement. We wanted to make a statement to pedestrians about the things we stand for: creativity, playful art, scrappiness, and a bit of irreverence. Plus, we thought the sidewalk banners might boost brand awareness generally. 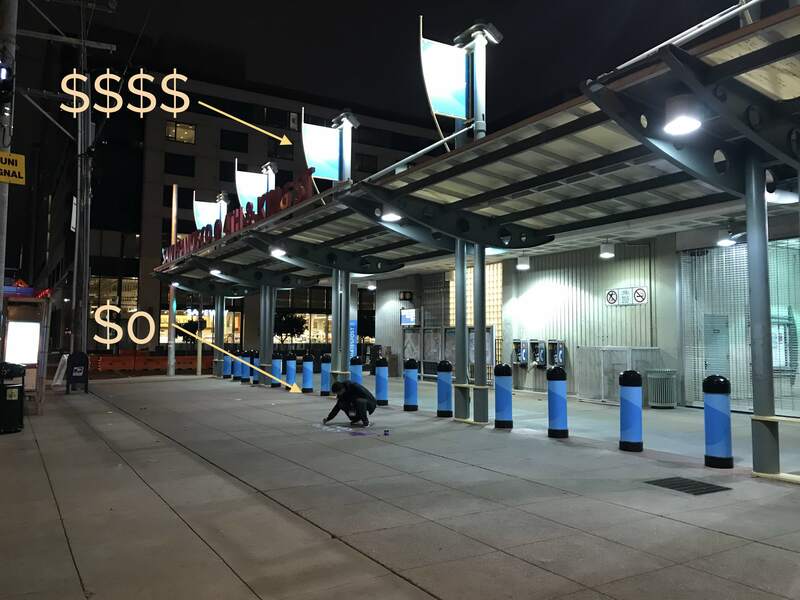 Startups pay thousands of dollars a month for billboards on Market Street and flags over the train station. We wanted to see if we could get the same effect for free. Is chalking illegal? No, we don’t think so. There’s a California state law against vandalism, but that only applies if you “maliciously deface or damage” someone else’s property. 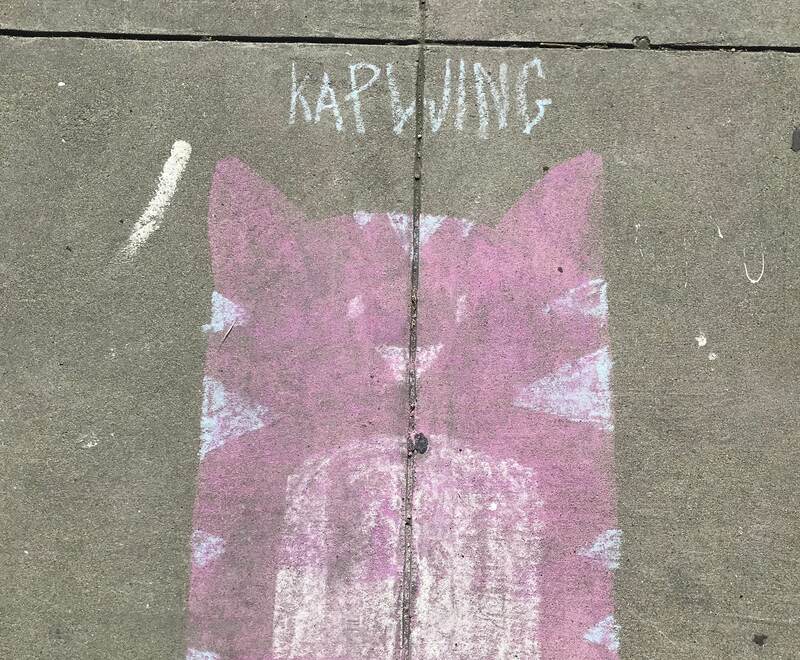 Sidewalk chalk washes off easily with water, and Kapwing’s cartoon kitten logo is harmless. There was even a 2013 court case in San Diego that found a chalker innocent. So we weren’t worried about getting arrested. I could not find a manufacturer who would sell me bulk purple chalk, so I ordered purple chalk “paint” and a bucket of mixed-colored jumbo chalk on Amazon. When it arrived, I practiced drawing the logo on the sidewalk near my apartment in Potrero Hill. The execution was surprisingly easy. No one yelled at us or asked us to stop. The few people asked us what we were up to, but they thought it was cool and encouraged us to continue. The sidewalks, while crowded with pedestrians during the day, were nearly deserted around midnight. It took just less than an hour for us to chalk all four places. 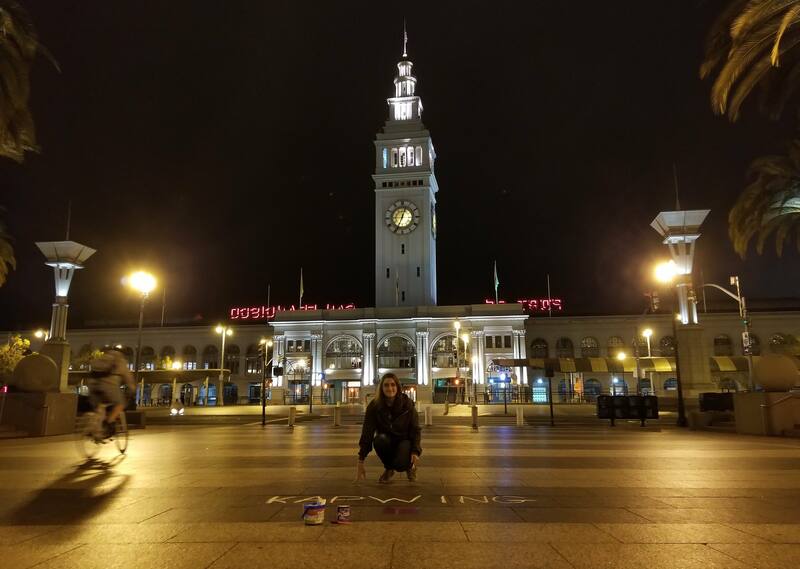 Sadly, the Kapwing chalk promos were quickly washed off in the highest traffic areas: the Embarcadero, the Train Station, and Market Street. Props to the City of San Francisco for a super quick turnaround - maybe this happens more often than we had perceived? Our chalk drawings did survive in South Park and Potrero Hill. I got a couple of texts from friends who work nearby, but we otherwise didn’t hear about our chalk on social media or from bloggers. Like many brand advertising channels, sidewalks don’t have ad tracking systems, so we don’t know what the impact of our experiment was. Regardless, I like the idea, and we’re considering ordering more chalk to let people know about Kapwing in new areas of the City. Marketing is a bonding experience: At the very least, we had fun running around the empty financhial district and painting the streets. Good bonding activity for teammates. Entrepreneurship is all about ideas that don’t scale: When I talked to my friends about the chalking experiment, I noticed that people who have founded a company got it; founders understood the drive to get on your hands and knees to chalk up Market St, even though it probably won’t work. That’s the glory, not the shame, of owning your own success. Thanks for reading! Stay tuned as Eric and I report back on other ideas that don’t scale.